Chocolate macaron with chicken liver mousse – Wow, this was the pinnacle of the whole meal for me. Just perfect. shortbread with pimento cheese – a little round cookie. The least successful morsel of the evening, it just kind of fell flat. tiny whiskey-honey cornbread madeilines. I mean really tiny, like the size of a big man’s thumbnail. Very tasty. Pretzel rolls with house-made butter. The elevation of Auntie Anne’s pretzel to it’s peak. duck/salted plum/rice/shiso/ramps/radishes ($28) – two little railroad ties of duck meat, great sauce, tiny amount of tiny-grain rice. As with everything else, perfectly cooked and seasoned. cheese plate ($12) – farmer’s cheese with carrot/coriander, calvander with celery slaw, blue cheese with apple compote, something creamy with pepper jelly. All served with really nice toasted sesame crackers. This was too much for us to eat at this point. 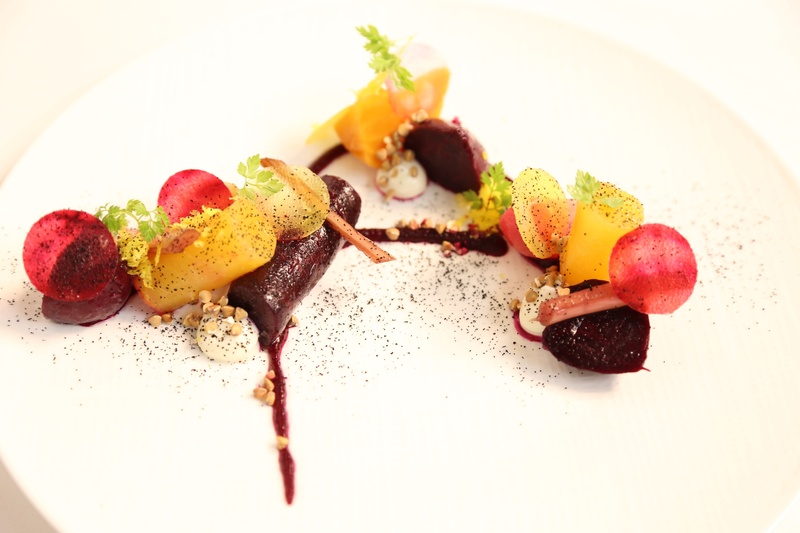 To sum it up, One may be the best restaurant in the Triangle, as some have proclaimed. It does present a level of cooking/presentation that I have not personally experienced elsewhere in the Triangle (though, not being rich, I’ve yet to hit many of the elite restaurants around here), although I must say some other meals I’ve had have been equally or more memorable. Let’s just say I would rush back if I was spending someone else’s money. The corner of Fairview and Oberlin Rds in Raleigh would seem to be a prime business location right in the heart of the upscale Five Points neighborhood. But while a small Chinese restaurant endures there, the spot next to it has had a handful of tenants come and go over the years, from Bellini to Mangia/Eat to EVOO and on back. Fortunately, that space is now occupied by Mandolin, a lovely farm-to-spot that, based on my recent experience, deserves more attention in the Raleigh (and broader Triangle) dining scene. The space is gorgeous, subtle, and refined, with brick floors and light grey walls. Accented by nice lighting, ample use of wood, and pops of freshly picked flowers, it shows a meticulous attention to detail. This is a white tablecloth and white leather chair kind of place – it’s definitely more fancy than casual. But it doesn’t feel too stuffy, and there’s a small bar at the rear of the space, complete with a TV for watching the game. At a recent Sunday brunch, the place was nearly vacant at 10:30, save for a few well-heeled Raleighites and a young hipster couple. The brunch menu is inviting, and generally covers the modern Southern repertoire. Many of the ingredients are sourced locally, and so the menu purports to change frequently, but many of the dishes I’ve seen listed online occasionally were available. After studying the menu for a few minutes, we were informed that the biscuits were still baking, but would be out soon. This quickly dissuaded me from ordering the biscuits and gravy. When they arrived, however, they were two well-browned dinner rolls, served piping hot with some honey butter. They were perfectly delicious, even if I wouldn’t describe these yeasty delights as “biscuits”. I ordered the pork madame (pulled pork, fried egg, and gruyere on sourdough, $12) and my wife ordered the Ham benedict (country ham, poached eggs, hollandaise, smoked paprika, $12). It was a monstrous sandwich, with the egg and cheese melted on top. The vinegary-ness of the pork was a pleasant surprise, and the bread was excellent, even if there was a bit too much of it. The dish really worked well. It was served with a tiny green salad and some home fries, the latter of which were one of the best renditions of had – exquisitely crusty and crunchy and well seasoned. My wife was almost as happy with her dish, although country ham can sometimes be a bit overpowering for her. The service at Mandolin was attentive and excellent, though it would have been nice to be informed early on about the complimentary “biscuits”. I look forward to going back for another brunch or for dinner, but do note that entree prices for dinner are generally $20-$30. To me, Mandolin is quietly one of the best restaurants in Raleigh, so here’s hoping it stays around for a long time to come. After several years, I finally got a chance to try Coquette, the French restaurant in Raleigh’s North Hills. Perhaps the main draw of this place is the atmosphere – it’s lovely. Coquette deliberately intends to recreate that quintessential French brasserie, and comes damn close with the look and feel – black and white flooring, marble surfaces, cafe tables and chairs, nice lighting, etc. It’s elegant and refined, and, even if it’s little vast to feel entirely cozy, it’s a beautiful place to come eat. The only place I know in the Triangle that’s even more wonderfully French is Durham’s Vin Rouge. Unfortunately, the food I tried did not live up to the setting. We went for a late lunch one day, and I was hungry. 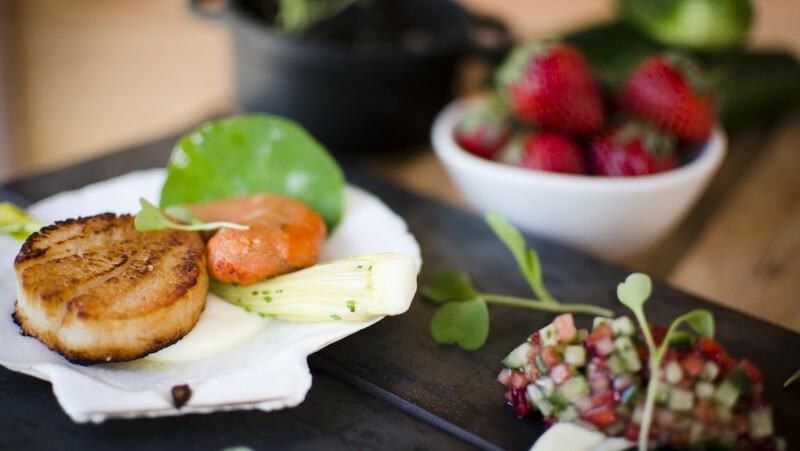 The menu runs the gamut of French standards – steak frites, moules frites, quiches, crepes, soups, you name it. There are a handful of sandwiches as well, including a $10-$12 hamburger. I started with the gruyere and potato croquettes ($5). These arrived as 2 or 3 oblong balls in a cute tiny pewter-looking chalise. They suffered principally from a very thick fried coating similar to what you’d expect on a cheap frozen fried mozzeralla stick, and were a little overcooked. My wife thought the accompanying garlic aioli tasted like straight up butter. We didn’t finish them. I moved on to a “frisee aux lardons” salad (curly endive, brioche croutons, cider grain mustard vinaigrette, $7). No complaints there. Finally I had the “Parisian Gnocchi” (chicken confit, butternut squash, dried cranberries, spinach, $8.5). This was listed as under “les petits plats” (small dishes), and it wasn’t huge, but, with a salad, was definitely enough for a full meal. The problem was it just wasn’t very good. The gnocchi were a bit dense, but, more than that, it was a rather unappealing, uninspired combination. My wife ordered a croque madame ($8.5), which featured a very runny egg, and came with a huge mountain of slim french fries. She was happy enough with her meal. I tried the fries, and they were ok.
Would I return to Coquette? Yes, for the atmosphere, professional service, and the hopes of a good brunch perhaps. And you feel like you’re in France. But for outstanding French food, I’d probably head elsewhere. My top choice in the area would be Durham’s Rue Cler. While this post isn’t strictly about food, I’ve just got to tell about this place. Gather is a co-working/boutique/coffe&tea bar in downtown Cary that’s run by my wife. If you didn’t know Cary had a downtown, shame on you! And if you’ve never been down there, it’s a charming sleepy little spot in the middle of the bustling Triangle, with it’s own train station, a handful of good eats, and, of course, this space. 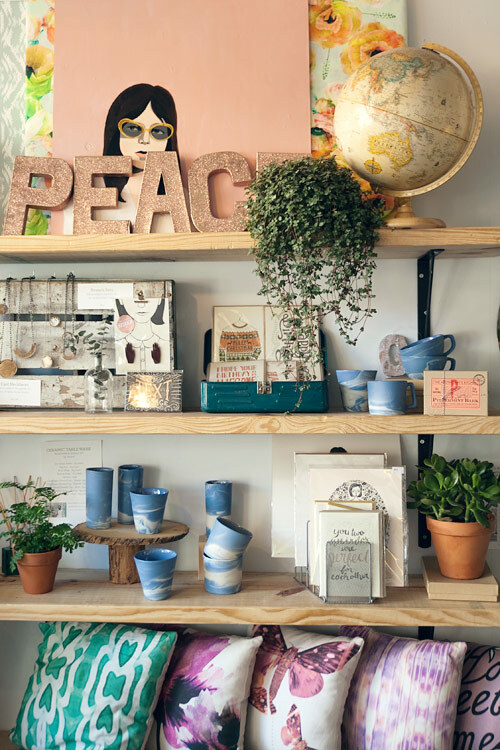 Here you can shop for the best of the best in locally made goods, from jewelry to apparel to wallets to artwork to food products, and you can enjoy a coffee or tea while you browse. When the shop is closed, you can rent space as a co-worker or attend one of the awesome classes held there regularly (see the schedule on the website). There’s also an amazing outdoor garden patio out back. The pictures (by our friend Amanda at Wit & Whistle) capture some of the wonderful vibe of the space, but I encourage you to come check it for yourself – I’m sure you’ll love it. It seems there’s been a proliferation of burger options around the Triangle in the past few years, so much so that one couldn’t possibly try them all. Many of these have been of the gussied-up variety, offering exotic and/or decadent toppings, putting a premium on the components and ingredients used (a welcome trend, admittedly), and, in some cases, charging you a pretty penny for something you can probably make pretty well at home. But the era of the straightforward burger has certainly not ended – just witness the growth of Five Guys, a chain that does a respectable job with the no-frills variety. Now, I’m a fan of both the high brow burger and the basic burger, and among the best I’ve tried in the latter category here in the Triangle is found at Corbett’s Burger & Soda Bar in Cary. Some may construe the 240+ sodas available here as a gimmick, and there are some weird options (chocolate covered maple bacon, cucumber, or espresso, anyone? ), but I’m here for the food. Corbett’s is located in the remote corner of a semi-forsaken strip mall in Cary. Let’s hope the location doesn’t doom their prospects. It’s clearly a family-run establishment, and an easy place to bring your kids. As for decor, it’s pretty sparse, with an old-fashioned bar lined with stools, some plain wooden tables, and an open kitchen right behind the cash register. The menu is not complicated – burgers, hot dogs, etc – but it is difficult to decipher on the jam-packed board hanging overhead. You can customize your burger or dog in many different ways, or choose one of their specialty options. I’ve eaten at Corbett’s three times and tried burgers each time. A ¼ lb burger starts at just $3.59, but you’ll add a little bit if you want a “premium” cheese and/or toppings. Impressively, many of these are house-made, like the pimiento cheese, buttermilk slaw, and virtually all of the sauces. A bag of fries (waffle style, seasoned or plain) tacks on another $1.99. The burgers are beautifully seasoned and come on a nicely grilled bun. It’s not fancy, to be sure, but it’s spot on. The fries are also nicely seasoned and cooked, and (for better or worse) you don’t get 50 lbs of them like you do at Five Guy’s. Corbett’s also does a variety of milkshakes, including flavors like root beer-banana and dulce de leche. Although I’ve yet to try one, these are an excellent deal at just $2.69/$3.35. When you want a classic burger and fries (and your choice of a billion sodas), head over to Corbett’s. This place does it better than Char-Grill, Cook Out, or Five Guys, to name just a few. 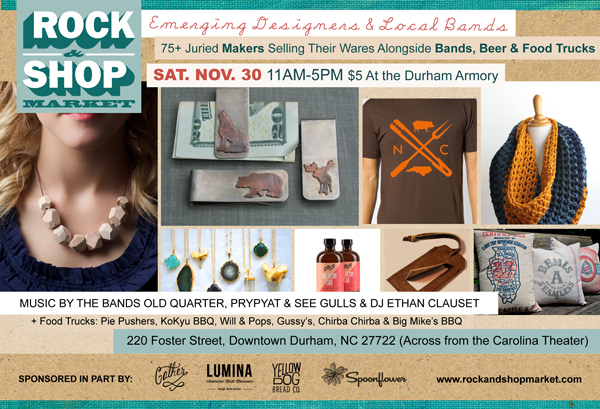 Next Saturday November 30th is the Rock & Shop Market in downtown Durham. This event is awesome – tons of great holiday shopping, live music, and 6 food trucks! The event is at the Armory and costs $5. Hope to see you there! Ashley Christensen has introduced a lot of good food to Raleigh over the years. While I wouldn’t necessarily say that her expansive empire has lent Raleigh a truly unique culinary identity, for me it has begun to dominate the city’s dining scene in the following way: her restaurants are often the first thing that come to mind when I’m asked “what’s good to eat in Raleigh?” Her latest venture to open, Joule, is not far from two of her other restaurants, Chuck’s and Beasley’s, and takes the place of the old Wilmoore Cafe on Wilmington St. Each one of these establishments has a distinct focus – burgers at Chuck’s, fried chicken at Beasley’s, and, at Joule, coffee. 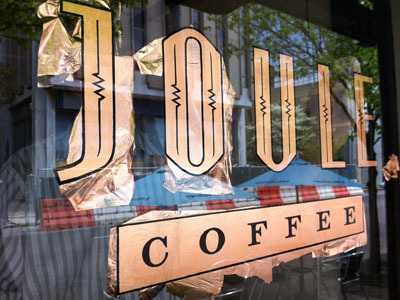 Fortunately for me (not a coffee drinker), there’s food to be had at Joule too, and from what I’ve tasted the quality is right on par with the excellent standards for which Ms. Christensen is known. The Joule space is decidedly more cozy than the austere restaurants down the block. The warmth comes from the low lighting and the rich color palette (orange/deep turquoise), as well as from the long wooden communal table down the center of the space (an element it has in common with Beasley’s). There’s also great bar seating along the inside of the deep windows leading to the front door. This is a great spot for solo diners or laptop warriors. Finally, there is a very small patio that looks out over the alleyway to the bus station. In the evening, Joule is more hushed and dark than boisterous. This is not your average coffee shop – there’s a hostess and full table service, but I’m pretty sure you can get a to-go cup of coffee straight from the counter. There’s an extensive coffee menu (obviously), some breakfast items, an “all day” menu (lunch and dinner) and, to top it off, a great brunch service on the weekends (replacing that which used to be offered at Ashley’s other downtown institution, Poole’s Diner). The “all day” menu includes some salads and a soup or two, as well as about 8 sandwich options. I went with a pork sandwich ($9.75) and my wife had the BLT ($8.75). We each added some excellent house-made “salt and pepper” potato chips for $2 apiece. My sandwich featured red curry braised pork shoulder, NC peanuts, house-made yogurt, and a spicy cucumber/red onion/cilantro garnish. Served on a house-made hoagie roll/baguette hybrid, it was terrific. But the BLT may have been even better. If featured some outstanding thick-cut tomatoes, malt aioli, and some great bacon. This was served on toasted sourdough (also house-made). My one complaint was that it was exceptionally messy, and the romaine’s crunch was drowned out by all the tomato juices and aioli. But, really, it was superb. Ms. Christensen has another winner with Joule. I really look forward to trying the weekend brunch at Joule, and to whatever comes next from this talented chef/entrepreneur. • Baker’s Dozen Donut shop (at South Hills mall) – This place has no website or facebook page, and the sign out front simply reads “Donuts”. They had a pretty big selection, and prices were cheap if I recall correctly – only 8 or 9 bucks for a dozen, and huge apple fritters for a lot less than $2. Donuts are pretty run-of the mill from my very limited sampling. Very sweet, no surprises. It looks like they stay open until 7 or 8 some evenings. • La Casa De Las Enchiladas – Kind of a house-like ambience. Very good salsa to start off with, along with freshly fried chips. The quesadilla huitlacoche (corn fungus – apparently a Mexican delicacy but a rarity around here) was good enough, but I probably wouldn’t order it again. The mole poblano was fine, other enchiladas were good and decidedly more spicy than most places (a plus for me). The torta cubana was massive and contains seemingly every single meat/ingredient they have. It’s a huge round sandwich that overflows with fillings. It’s good, and could easily feed two. There’s also a nice salsa/condiments bar. I’d definitely go back. • Lucky 32– We went back again but I have to say I’m consistently underwhelmed. The menu always sounds great though. I Finally tried the voodoo pig bread – pulled pork, red onion, chevre, cilantro, voodoo sauce on ciabatta (+ some melted mozzarellla I think). It was fine but not worth going out of your way for. The service at this place has always been excellent though. • Bella Mia – We finally went back after a long hiatus (and after their change in ownership a while back). We went with the calzone with ricotta and sausage, which had so wowed us previously. It was very similar, but somehow not quite as amazingly delicious. Still really good. The roasted chicken wings to start were the exact same – very nice! 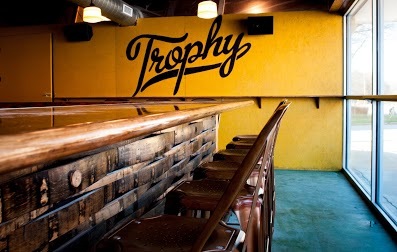 Trophy Brewing & Pizza Co. is a new spot in Raleigh that brings a bit of Durham cool to this side of the Triangle. 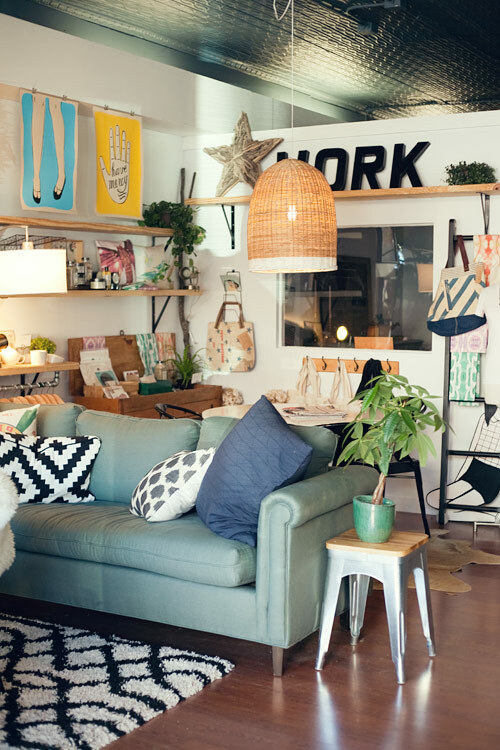 This place is the epitome of hip: it’s stylish without feeling forced. Located on a overlooked stretch of Morgan St. heading into downtown, it has promptly become a place to see and be seen, but it functions equally well as just a nice place to hang out with your friends. Inside, it’s small – almost too small. It’s tough to even walk behind the bar on account of a couple rustic barrels that line the glass-fronted space. Sure, there are handful of patio tables, and you can get full service at the lovely, expansively deep bar, but the bottom line is this: expect a crowd. The decor is well executed in yellow ochres and browns. A cadre of trophies lines a high shelf towards the back – it would be cool if these belonged to the owners (also of downtown’s “Busy Bee“) or to the chefs, but I didn’t inquire. There is a small menu of pizzas and salads. The pie toppings here are gourmet in the style of Durham’s Pizzeria Toro, but don’t sound quite as inviting (you can create your own too). You can order a personal size (9″) or a large (18″). I went with a small “Most Loyal” (basil pesto, chicken, mozzarella blend, tomato, honey, $10) and my wife chose a small “Most Outgoing” (mushrooms, caramelized onions, brie, mozzarella blend, tomato sauce, arugula, also $10). The crusts here are Lilly’s style, thick and doughy, but perhaps not quite as good. The amount of bread means though that even a 9″ pie is probably enough for most folks – neither of us were able to finish an entire one. Overall, I found the pizzas fairly average, even a touch bland. My wife liked hers a good bit, while I went back and forth on which was better. I rather liked the honey on mine, which was just a hint but added some needed complexity. Hers was piled high with fresh arugula and contained some nicely cooked onions, but I kind of missed the brie in there. Not being much of a drinker, I didn’t try the beer, but it’s well regarded from what I hear. Trophy kind of reminds me of Durham’s Fullsteam (minus the hangar-like space, and the games, and plus the food). It’s got the laid-back vibe, the friendly staff, and the cool factor: it’s an easy place to have a good time. The pizza may not be stellar, or even the best in Raleigh, but this is definitely a place to which I’d return. I recently traveled to Cincinnati for a work conference. The conference was held right downtown, so I got to do a little walking around the riverfront and Over-the-Rhine districts. The city has a lot of interesting old architecture, and, from what I’ve heard, has enjoyed quite a renaissance over the last few years. I stayed away from the well known local specialty Cincinnati chili, which is basically spaghetti with a cinnamon-inflected meat sauce and (if you like) a mound of shredded cheese or beans on top, but I did score some other delicious eats in my brief time there. Quan Hapa – This is an Asian street food place that’s small, cute, and modern. I went with two steamed bun sliders: pork belly (garlic scallion, pickled daikon & carrot, peanut aioli) and sweet potato croquette (with coconut creamed spinach). The buns were a little gummy and doughy, but the fillings were great, especially the pork. I also got an order of their chicken wings (marinated in lemongrass & soy, tossed in nuoc mam and honey). These were smoky, sweet, and addictive, not fried terribly crispy but very satisfying. Finally, I could not pass up an order of the “vietnamese coffee bread pudding” – rich little chunks of bread soaked in a thin sweetened condensed milk/coffee liquid with chocolate chips melting everywhere. Wow! It was fantastic. Taste of Belgium – I walked up here one morning to grab a Belgian (liege) waffle. It was kind of a life-changing experience. I ordered a plain one, and, though I was a little surprised by the density and sweetness of the thing, it was just insanely delicious. I guess I haven’t had that many true liege waffles in my day, but I may just spend the rest of my years attempting to make the perfect one at home. Senate – Ok, this is the au courant gastropub duck fat kind of place. They’ve got all kinds of gussied up, decadent hot dogs on the menu, and not too many vegetables. 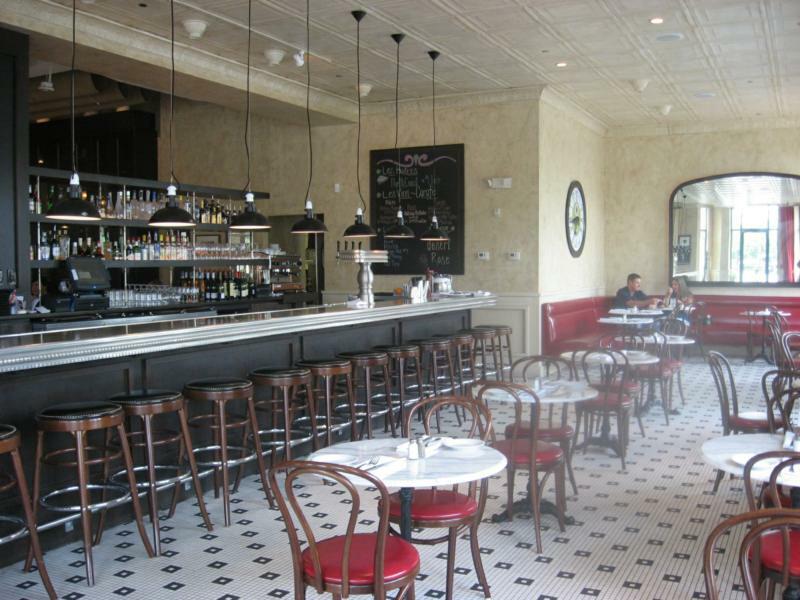 The inside is nice, with exposed brick walls and a marble bar. I ordered a lobster BLT (butter braised lobster, bourbon smoked bacon, baked egg bun, basil mayo) and some truffle fries. The sandwich was decent despite some tough, sinewy lobster meat. I think it was saved by the bacon, which was exceptionally good, and a light feathery bun that surprisingly held up to the filling. The truffle fries were good as well, crispy and flavorful. Graeter’s – Of course I had to try the local ice cream maker, who is known for their chocolate chip varieties. This is because, from what I’ve read, they use the “French pot” method of making ice cream, in which molten chocolate is poured into the churning mix, resulting in randomly sized shards of chocolate rather than uniform pieces. I ordered the black raspberry chip, and was richly rewarded. It was really good. There was actually a massive hunk of chocolate buried in my cup, but I’m not complaining about that.